I hate cleaning the shower in my master bathroom. I have tried many different cleaning products, and most of them contain harsh chemicals. 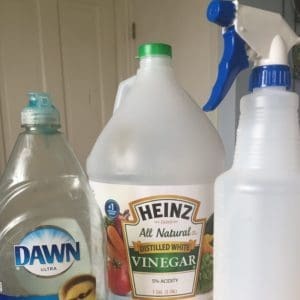 The great thing about this DIY cleaner is that it is non-toxic, and made from only two ingredients: white vinegar and blue Dawn dishwashing liquid. You will need to have an empty spray bottle. I like to keep a supply of empty spray bottles on hand for making a variety of household cleaners. The original recipe calls for 12 oz. white vinegar, and 12 oz. Dawn dish soap. You can use any amount you want to, as long as you use the same amount for both ingredients. Heat the vinegar in the microwave until it is hot. Using a funnel, pour the vinegar into the spray bottle. Pour in the Dawn dishwashing liquid. You are now ready to use your miracle bathtub and shower cleaner. One thing you want to keep in mind when you are spraying this stuff is that a little is better than a lot. If you spray too much, you are going to end up with a lot of soap to wash off. What I found worked best was to spray the cleaner on, scrub it in a little, rinse it off, and then wipe it down with a dry towel. What really impressed me about this cleaning solution was the great job it does on faucets and on my glass shower doors. The faucets were absolutely shining. This solution does a great job of removing hard water deposits from your sink, shower, and bathtub faucets. It also does a great job of removing soap scum off of shower doors. 5 Comments on "Miracle Tub and Shower Cleaner"
Love the tip for the shower glass…always a problem. You mentioned the soap that can get to be a problem. That can be the worst part. RINSING THE SOAP! I use a Rinseroo for rinsing. Love it! It slips over the showerhead and makes the whole rinsing thing fast and easy. No more bucket rinsing for me! Just curious, what is the purpose of heating the vinegar before adding the Dawn? Do you have to warm this cleaner before each use? Thanks. Having real chemical issues and trying to find non-toxic, natural ways to clean my home. Hi! I only warmed it up the first time. I think it helps them blend together better. I love this homemade cleaner, it definitely does a good job! When I make my cleaner it is the same as yours except I add lemon juice. It make for a better cleaner.